More than 200 participants from over 22 countries have already registered!! in Myanmar Mines & Minerals"
"Updates on Myanmar Mining Law & Fiscal Regime"
"Updates on NEW Myanmar Investment Law for Foreign Investments in Mining Sector"
"Australia to help Myanmar build Mining Regulatory Regime"
"Japan's Itochu joins the charge of the Mining Brigade in to Burma"
"Obama Administration declares Burma Open to U.S. Mining Investment"
"SE Asia eyeing Myanmar's Steel Potential"
"Northquest Ltd. announces the submittal of a gold exploration permit application in the Union of Myanmar (Burma)"
CMT's Myanmar Mining Summit, the 1st OFFICIAL summit organised by CMT and Myanmar's Ministry of Mines, is the ONLY platform for global and regional miners, investors, local and overseas stakeholders who seek resource investment, exploration and mine development opportunities in this fast emerging mining hot spot - Myanmar. The 3-days' event provides first-hand information and answers, preparing industry majors and investors as well as service and support companies for ventures into Myanmar's mining sector. Comprised of key officials from Ministry of Mines and Department of Geological Survey & Mineral Exploration (DGSE), global mining companies, as well as foreign investors and independent experts, the authoritative panel offers clear directives and balanced perspectives on the opportunities ahead in Myanmar's mining sector. taking part in regional cooperation relating to investment matters. Be at this exciting event and make new contacts! CMT's Myanmar Mining Summit offers extensive business networking opportunitieswith Asian and global players in one venue! Signup with your team to enjoy group discount. Register online at www.cmtevents.com or email to huiyan@cmtsp.com.sg. "Introduction to Business Ventures in Myanmar"
Residing in Yangon, he helps local and foreign companies involved in mining, corporate, infrastructure and banking & finance transactions. CMT is facilitating dedicated private consultation session between you and the Mines officials from 23rd to 24th July. 20 slots of 20-minutes are available for bookings by summit participants, via email huiyan@cmtsp.com.sg. T&C: First come first served basis, one session per company. Priority will be given to the companies signing for the bundle deals. Cut-off date for last reservation is 14 July, and you will be notified of your appointment slot by 17 July. Book your appointment with the officials now! 22 July 2012, 14:00 - 17:30hrs. 24 July 2012, 14:00 - 18:00hrs. Current trends in lending and project financing. 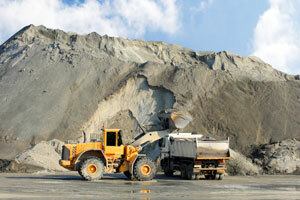 Options for Financing Mining Projects in Asia. 25 July 2012, 09:00 - 17:00hrs. Download the Opening Speech presented at 1st Myanmar Mining Summit by Union Minister for Ministry of Mines, HE U Thein Htaik here! Thank you for your interest. Simply fill up the form below, click submit and check your email for the requested material. The 3.5 day Myanmar Mining Summit in Yangon is just a week away, on 22-25 July. In addition to delivering a comprehensive outlook at the mining opportunities and first-hand information via official talks by key Ministry officials, the event will also see presentations by experts from the private sector such as gold mining companies, foreign investors and others. In addition to these are 3 specialised workshops designed to present in-depth information on investments, JVs, project financing, geological details and many more. There is still time to Register to attend this summit. Else contact Ms. Huiyan at huiyan@cmtsp.com.sg for further enquiries. The gold mining industry in Myanmar holds great potential, and certain gold exploration targets have not been thoroughly explored. Belarus mineral ministry said that Myanmar has accepted its application to participate in the development of deposits of gold, copper and tin. The former soviet state said that it will start developing valuable minerals in Myanmar soon. From February 28 to March 6, 2012, a group of Belarusian experts stayed in Myanmar to ascertain the development and mining prospects. 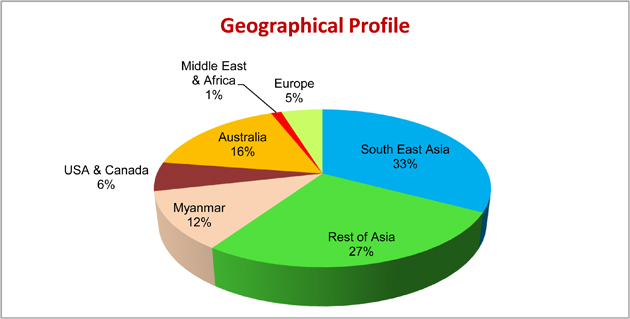 A preliminary analysis reveals that Myanmar is rich in ore minerals. The Government of Belarus will be handed the analysis of geological prospects of selected locations in Myanmar, including the feasibility of commercial development of the mineral deposits unearthed during the exploration. The analysis will be provided by the Department of Geology at the Ministry of Natural Resources. Last month, the Obama Administration announced that it will suspend restrictions on U.S. investment in Myanmar’s mining industry. U.S. Secretary of State Hillary Rodham Clinton said during a meeting with Myanmar’s Foreign Minister U Wunna Maung Lwin, “First, let me say that our presumption is that our companies will be able to deal in every sector of the economy with any business. ...The presumption is that our oil and gas companies, our mining companies, our financial services companies are all now free to look for investments that can be mutually benefits to Burma and them." Sen. Jim Webb, D-Virginia, chair of the Senate Foreign Relations East Asian and Pacific Affairs Subcommittee noted that the European Union lifted its sanctions against Burma, as did mining powers Australia and Canada. He also remarked that, "The President has wider powers with respect to economic sanctions and he should use them to lift all economic sanctions." Reports by the U.S Geological Survey show that a variety of mineral commodities including cement, coal, copper, lead, precious & semiprecious stones, tins, tungsten and zinc are produced in Myanmar. According to the Financial Times, Caterpillar and other U.S. companies are already involved in businesses in Myanmar via third parties. Meanwhile, France, South Korea, Thailand and China have invested in Myanmar’s extractive industries. The State of Myanmar and the China Nonferrous Metal Mining Company own the Tagaung Taung Nickel Mine, Myanmar’s biggest mining project. As more countries lift sanctions and promote business relations with Myanmar, companies and conglomerates are actively on the lookout for the latest updates. Hence the Myanmar Mining Summit is timed aptly, coming soon on 23-24 July in Yangon, with key official speakers who will examine the country’s mining scenario, as well as other major economic developments. This conference is the 1st Official Summit organised with the Ministry of Mines, and His Excellency U Thein Htike, Union Minister of Mines will grace the event with the Keynote Address. Australia has made a move to lift sanctions against Myanmar’s President, as well as over 200 civilians who were under travel and financial bans EU may also formally announce next week, that while sanctions may be suspended for 6 months to 1 year, it may not be lifted altogether. While Australia’s ban on defence exports remains unchanged, and Canberra does not impose general trade sanctions, suspension of EU sanctions is likely to bring in investments to the country, largely because it neighbours China and India, the world’s two biggest markets. This decision came after a joint call to lift the sanctions against Myanmar was issued by British Prime Minister David Cameron and Myanmar opposition leader Aung San Suu Kyi. The British Prime Minister also said, "We want to see the further release of political prisoners, we want to see the resolution of ethnic conflicts, we want the democratization process to continue." Summaries extracted from Reuters and Channel News Asia. Indeed, just few weeks ago, MOGP Summit (Myanmar Oil, Gas & Power) the first Official Summit organized by CMT with the Ministry of Energy, Myanmar welcomed over 300 participants looking to seize the opportunities to be had. At the summit His Excellency U Than Htay, Union Minister of Energy, Myanmar presented a keynote address that unveils future plans for the Oil & Gas sector. 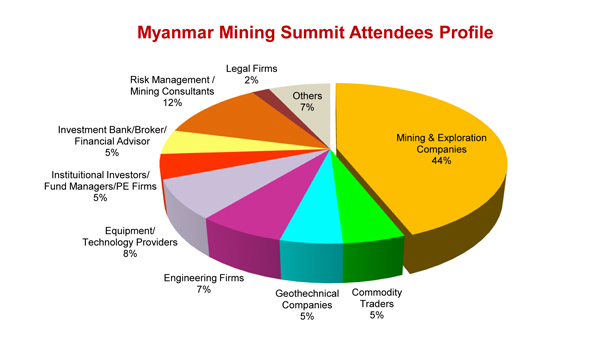 In a spin-off to MOGP Summit, CMT is proud to now announce the Myanmar Mining Summit 2012 to be held on 23-24 July 2012 at Yangon, right where all the excitement is! Just like the MOGP Summit, key officials this time from Mines & Investment Depts, Mining & Exploration Companies, Commodity traders, Geolotechnical specialists, Institutional Investors, Fund Manager, PE Investors, Investment Bank/Broker/Financial Advisor, Service/Technology Provider and many more are expected to attend this timely meet. To be among the first to establish commercial presence in Myanmar you should make plans to be in Yangon this 23-24 July! And to give you a head start on the type of information you could be gathering, we invite you to review the keynote address that was delivered at the above-mentioned MOGP summit. Simply fill up the form below to download.